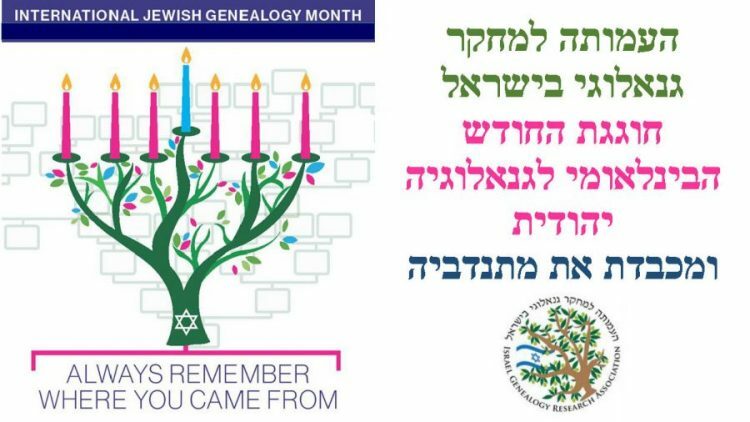 Each year in conjunction with the International Jewish Genealogy Month IGRA hosts our Heshvan Event. Don’t miss your opportunity to meet up with IGRA members and others in the genealogy community, pay tribute to our fantastic team of volunteers, congratulate those receiving special awards and hear a variety of lectures. This year the IGRA Heshvan Event will be held at the National Library of Israel on the Givat Ram campus of Hebrew University in Jerusalem, October 18, 2018 – 9 Heshvan 5779. Our day begins at 09:30 and will last until 16:00. During the Opening Session we will be honoring our volunteers and presenting awards to two institutions and two of the volunteers will receive the Mathilde Tagger Prize of Recognition For Volunteering With IGRA Databases. As you look at the schedule you will notice that most of the lectures are offered in pairs – one in English and the other in Hebrew – allowing you to choose the lecture of most interest to you for each session. Also note that we are offering a “behind the scenes” tour of the National Library. On the registration form it is necessary to designate your desire to join this tour and the language you prefer (English or Hebrew). *Volunteers receiving recognition will be sent a special registration code. Recognizing that many of our members will not be in Israel at the time of the event we are hoping to record most of the lectures and make them available on our website at a later date. Beginning in the 1970’s, many books and articles were written on the origins of Ashkenazi Jews. Some hypothesized that Ashkenazi Jews descended from an Eastern European kingdom that converted to Judaism en masse in the 8th century, thereby discrediting the Jewish people’s connection to the land of Israel. More recently, a handful of historians and scientists have followed the same hypothesis. Join us for a discussion about these claims and compare them to the genetic record. MAX BLANKFELD, is a managing partner and the COO of Gene by Gene/FamilyTreeDNA. He was born in Germany, but soon after, with his parents, who were Holocaust survivors, moved to Brazil. After his graduation, he started and managed several successful business ventures in both in Brazil and the US. In 2000 he teamed up with Bennett Greenspan, a long-time friend and business partner, at Family Tree DNA, to start the pioneer direct-to-consumer DNA testing company. Following the story of the Jewish community of Fez, in the past and up until the present. A community that is reuniting digitally through Facebook groups. EINAT LEVI is developing Online learning processes and learning environments, and leads projects to strengthen the connection between Israel and the Diaspora at the Center for Educational Technology (CET). In addition, Einat is a researcher at the Mitvim Institute for Regional Foreign Policy Development, specializing in Morocco’s political and social arena and its relations with Israel. Since 2013 she travels between Israel and Morocco, and is engaged in consulting and developing partnerships between the countries in various fields, leading educational tours and delegations. Einat deals with the digital documentation of the heritage of Moroccan Jewry, including the development of virtual tours in VR and Facebook documentation groups. Einat is a graduate of the ISEF Foundation – a leadership program for reducing gaps in Israeli society. Since the exile of the Jews from Eretz Israel with the destruction of the First and Second Temples in Jerusalem, many have dreamed of returning to Eretz Israel, of making “aliyah”. Various types of records can be found that document the return of our ancestors over the last 200 years. Lists survive from the 20th century of immigrants including requests for visas, lists of exiles by the Turkish and deportations by the British. In addition, there are other types of documents, not directly connected with “aliyah”, that state where people came from and when they immigrated. Examples of available documents and resources will be shown in the lecture. ROSE FELDMAN is in charge of developing databases for Israel Genealogy Research Association [IGRA]. She has lectured at various annual seminars and branch meetings of IGRA and IGS, at the Israeli Association for Archives and Information workshop, and the genealogy workshop of the Central Zionist Archives. In 2017 she was the recipient of IAJGS Award for Volunteer of the Year. Rose was one of the three coordinators of the Montefiore Censuses Project, has four Kehilalinks sites on JewishGen, operates two twitters for IGRA – Israelgenealogy and IGRA_Hebrew and IGRA’s facebook page. Ralph Salinger began his family history in 1982, a time before there was internet, researching from just a few names then to a vast family tree today. Discovering that one branch of the Salinger family came from Vilkaviskis, Lithuania. he returned there in 2005 to find nothing of the once vibrant Jewish community. This presentation tells of the many good local people who have helped restore the memory, of contacts with over 250 Jewish families who have their roots there, and of the activities, many there, to restore the Jewish memory of the town and build the bridge between Jews, Israelis and Lithuanians. RALPH SALINGER was born in London and grew up in New Zealand. He came to live in Israel in 1975, he is living in Kfar Ruppin. Ralph has spent over the past years twenty years researching his family’s history. Recently, Ralph has been involved in examining the history of Jewish Vilkaviskis and various other projects in Lithuania. He is an active board member of LitvakSIG and MACEVA. The author describes in her book, the research journey after her mother life. From her birth at the “Hayishuv Hayashan” in Sefad, to her death in Jerusalem. ORA AHIMEIR, author of the books “Kala” (Bride) and “Araratim”. She was one of the founders of the Jerusalem Institute for Israel Studies, and served as its director for many years. In 2011 she received an Honor Citation from the city of Jerusalem for her contribution to the city. The story of Jon Stedman and Kelly Moore involves mystery, bigamy, adoption and DNA. The secretive life of Jesse Oppenheimer, alias John Stedman (1887-1950) was unraveled using family research techniques that are useful to all genealogists, as well as DNA testing. Though his son Jon’s DNA sample was one of the first tested in 2000 (he was FTDNA’s first match), an upgrade in 2013 (four years after Jon died) helped an adopted woman, Kelly Moore, find her birth family. The PowerPoint presentation will provide details about the role of DNA testing in her search, and the story of Jon’s collection and how it can be helpful to genealogists. The John Stedman Award presented annually by the IAJGS, was named for John Stedman, the man Kelly learned through our research was Kelly’s great-grandfather. KAREN FRANKLIN, is director of family research at the Leo Baeck Institute and president of the Obermayer German Jewish History Awards. She has served as president of the International Association of Jewish Genealogical Societies and chair of the Council of American Jewish Museums, as well as co-chair of the Board of Governors of JewishGen and chair of the Memorial Museums Committee of ICOM (the International Council of Museums). In 2012 Karen was awarded the ICOM-US Service Citation for her work in Holocaust-era property restitution.